Cap hand-sewed together, with the opening hand-hemmed, after pressing. In class, we copied the pattern, cut out our linen, hemmed the opening, and sewed the top seam closed, finishing the edges. (I did a French seam here, though there are far prettier versions I’ve seen online with open work between the pieces. The cap sat in my to-do bag for a while… before I picked it up again. Later, I ended up pressing the cap, and making the binding for the band, and stitching it to the edge… but since there had been time passed between the class and then, I totally forgot to gather the back – which meant the cap didn’t work at all. 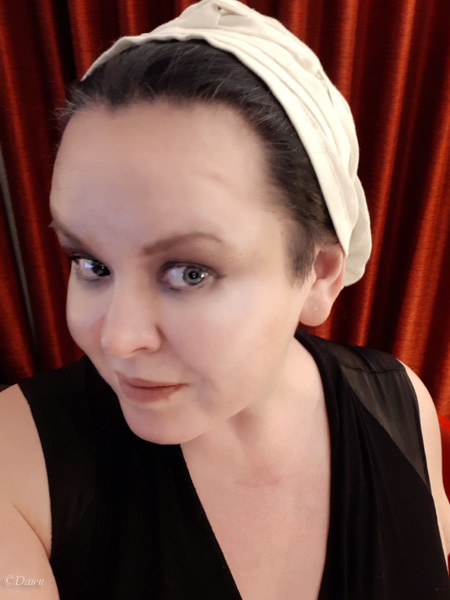 Finally, I was heading up to Edmonton for a week of work training, and knew I’d have a few free evenings (less than I thought, since I was able to visit with a few friends!) so plucked it out of the bag to continue working on. I often put off hand-work, but with no machine, it would be a good time. I unpicked the part of the band that should have been gathered, gathered up the cap, and re-stitched the band. I opted not to stitch the band in a loop, and will likely tie it or pin it instead when (if?) I wear it. Katafalk has a great blog post about making a cap pretty much exactly like this one. (Including a pattern.) 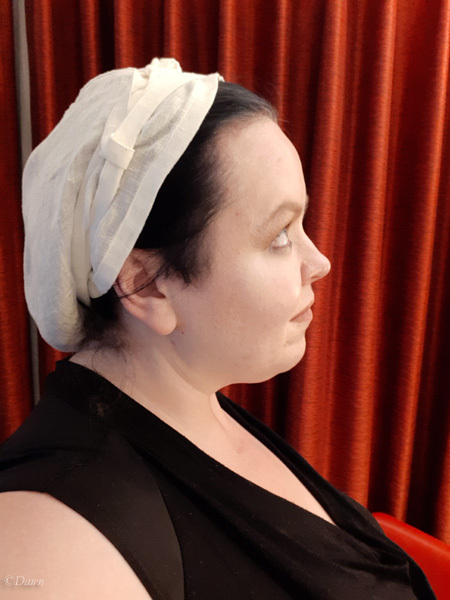 She shows it worn so that the hair is not seen at all, with her wimple and veil. On the Medieval Silkwork website on the other hand, it’s shown in period images worn alone as well, and further back on the head so that the front hair does show. How historically accurate is it? I honestly didn’t research it much before I started, and just followed Coryn’s instructions. However, based on period artwork and an extant cap show on the Medieval Silkwork website, it appears that the shape is accurate. Hours to complete: No idea. Probably 1 hour in the class (including pattern making and much conversation, and another hour afterwards in total. First worn: Only for photos so far. 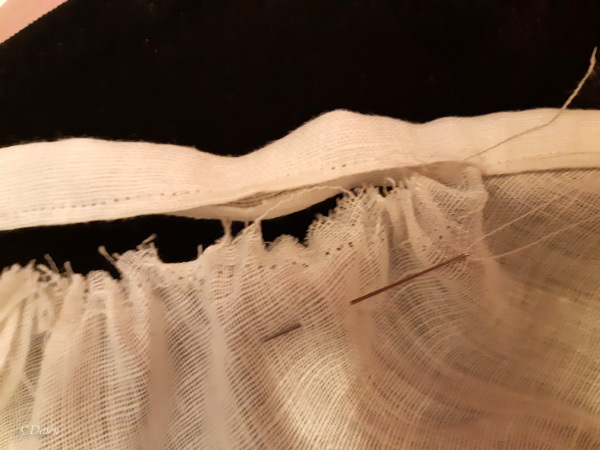 Total cost: Perhaps $5.00 Cdn in linen, not including shipping – though If I remember correctly the main body was cut from leftovers from a semi-circular veil, so were essentially scrap. If you want to see more of my work-in-progress photos, come follow me on Instagram! 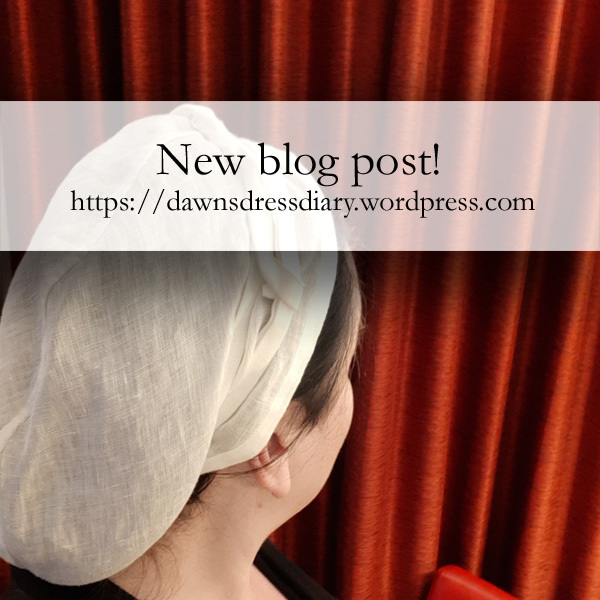 If you want to see more finished projects, please either subscribe to my blog, or follow me on my Dawn’s Dress Diary Facebook page, where each of my blog posts gets published so you can see when new posts come out. 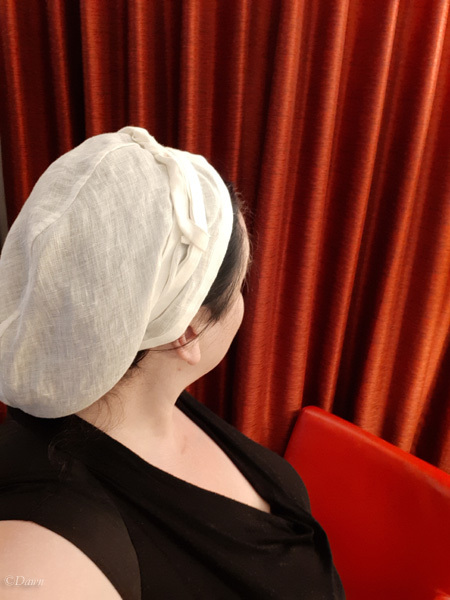 This entry was posted in 14th Century English, 15th Century Europe, Accessories, Historical Sew Fortnightly, Medieval, Millinery and tagged cap, dressmaker hats, hat, HSF, HSM, HSM2019Feb, Medieval, Medieval Millinery, millinery. Oo, I think I need something like this for everyday wear when it’s hot. Thanks for providing the helpful links!